The core component to any Airsoft game day! Lets all take a moment to step back and be thankful for BBs! Without BBs there would be no Airsoft Games, and the closest game would be.. well.. paintball. Thankfully as Airsoft players we have been granted the gift of the Airsoft BB, which comes in multiple weights, types, with some that even glow in the dark! Take that paintball! Here at Patrol Base we offer a wide range of Airsoft BB designed to suit any Airsoft replica. We have a variety of weights, ranging from 0.20g for standard AEG to ultra heavyweight 0.50g BB for sniper rifles. Wanting something a little bit more specialist? We have most of our brands and weights available in Tracer and Bio as well! At Patrol Base our staff are the ones who select which brands of BB we sell: if we won't use them, we wont sell them! All of our BB have been used by our staff in their own personal weapons so you can rest easily knowing that if you buy BB from us they're going to be of the highest quality. Don't waste your money on 0.12g bb, and avoid seaside special yellow bb! All of our BB are seamless, highly polished, and perfectly suited for Airsoft gameplay. These types of BB are your average BB. They're the standard go-to type of BB, nothing special about them, they just work! Unless your site requires you to use biodegradable bb then these are the BB you'll be using. As this type is the most common there are the widest range of weights available, allowing you to highly customise your shooting experience. You can check out our range of Standard BB on our Standard BB Page. These types of BB are infused with a glow in the dark ink, dye or material, meaning that when fired through an Airsoft tracer unit they will glow. Some people use these to track where they are shooting, making them great in dark and indoor cqb environments, and some people even squeeze a few into their magazine first so they know when they're running low on ammo! You can check out our range of Tracer BB on our Tracer BB Page. Also know as Biodegradable BB these BB are specifically designed to break down faster than other BB, so that residual waste BB littered on the game site will slowly dissolve until they disappear. Though uncommon, there are some Airsoft sites which require the players to use these BB, such as heritage sites, or sites in some protected woodlands. You can check out our range of Bio BB on our Bio BB Page. Looking for a specific BB Weight? Need a specific weight to work with your gun? No problem! 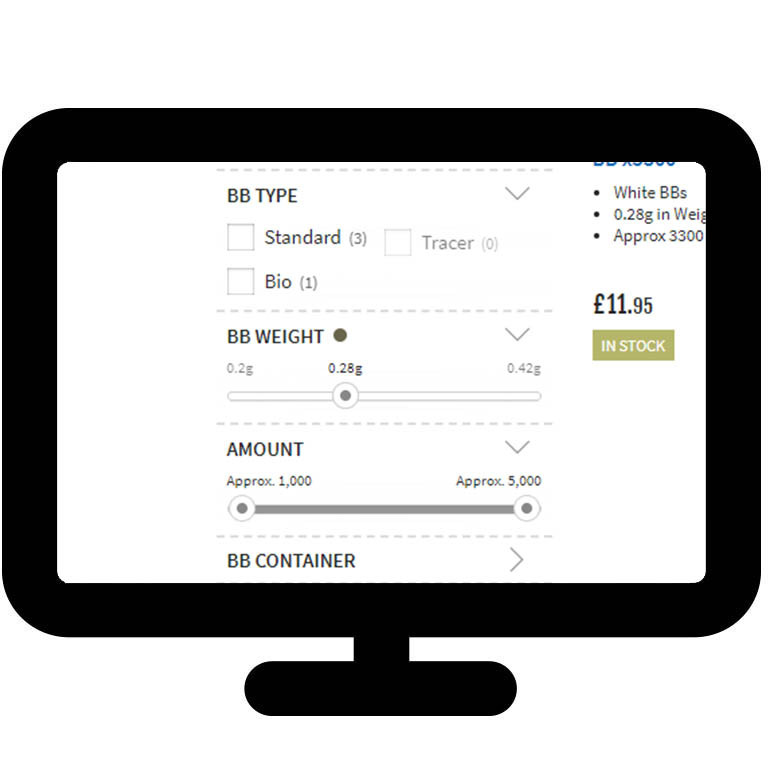 We have a filter which allows you to select the weight of BB which best performs with your weapon. You can find Filters at the top left of any page on a Desktop web browser, or via the green filter tab of any page on your Mobile.